Unable to find specific bluetooth devices (for instance, calculator, GPS, radio devices) on the Windows side. Bluetooth devices are not detected inside the virtual machine. 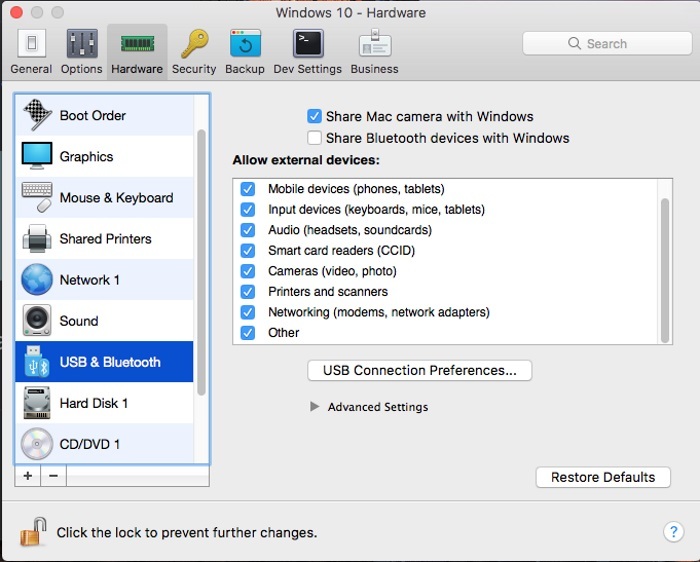 Apple Bluetooth USB Host Controller support is very limited in Parallels Desktop (or any other virtualization solution) due to stability reasons. Assigning Apple Bluetooth USB Host Controller used to cause all connected wireless (Bluetooth) devices to disconnect from host. 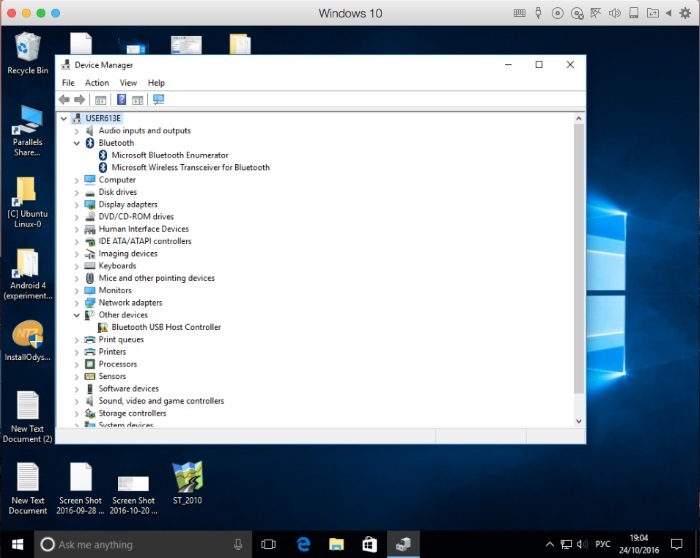 Therefore behaviour was changed in Parallels Desktop 12 where an ability to connect Apple Bluetooth USB host controller to the virtual machine is not present by default. NOTE: Apple Bluetooth USB Host Controller isn't optimized for work in Windows guest systems. There might be possible issues when using Apple Bluetooth Controller in Windows virtual machine. 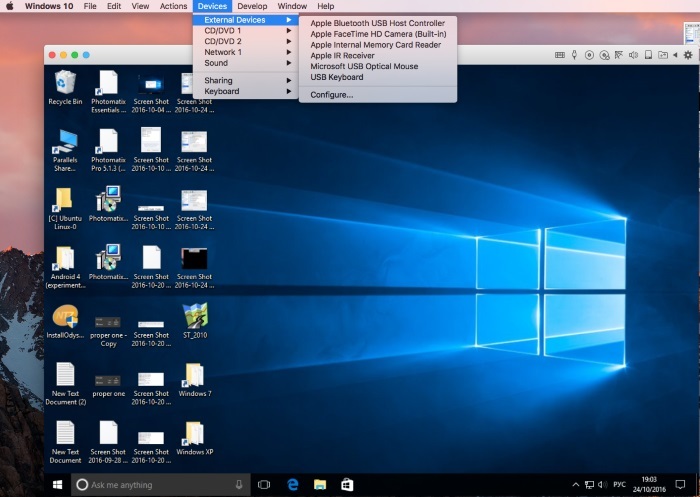 Parallels recommend one either to use Share Bluetooth device with Windows option in VM settings or to use separate USB-Bluetooth device when working with Bluetooth in Windows virtual machine. In Parallels Desktop 12 one can share Bluetooth functionality between both Mac and Widnows side. 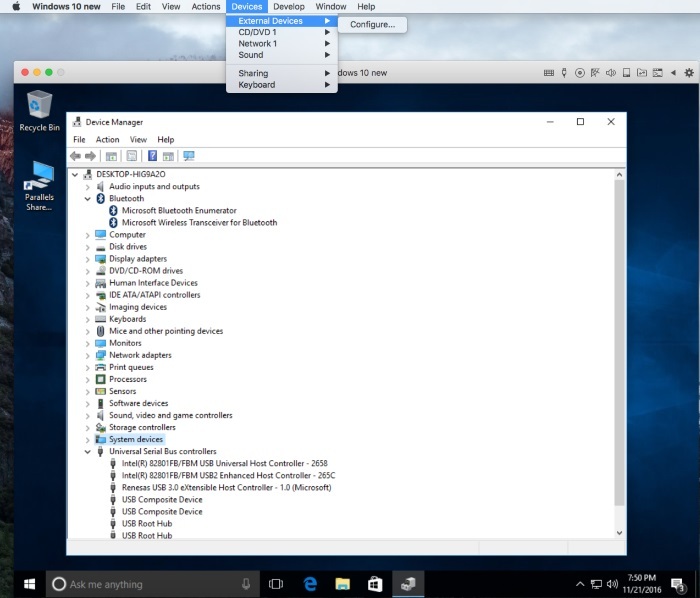 Simply open virtual machine configuration > switch to Hardware tab > then select USB & Bluetooth. 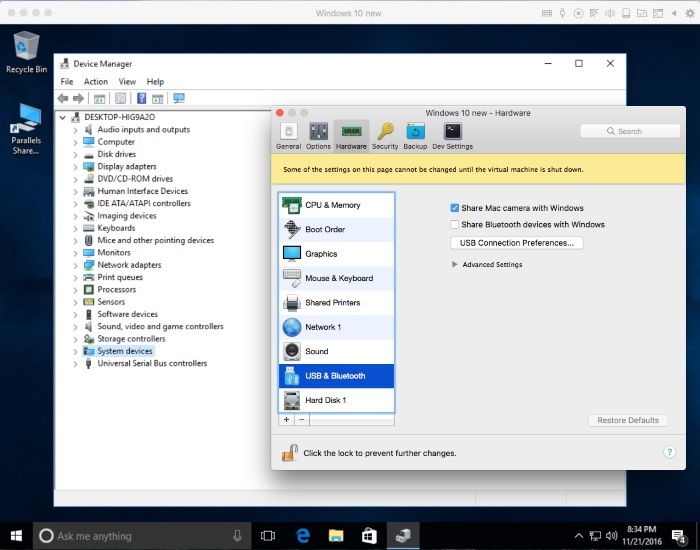 You can disable sharing of all Bluetooth devices between Windows virtual machine and Mac side. In case Share Bluetooth devices with Windows option is checked two Microsoft Bluetooth adapters are emulated on Windows side. NOTE: Bluetooth devices on the Mac side will be not available, while Bluetooth Controller is passed in the VM. To return it back to the Mac, untick Devices -> External Devices-> Apple Bluetooth USB Host Controller. Check that on the Mac side that the Bluetooth is on. 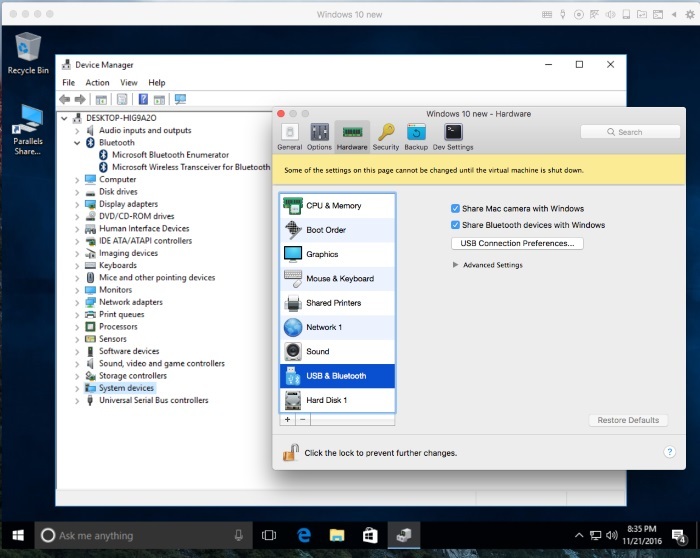 In the virtual machine Configuration open Hardware -> USB & Bluetooth -> untick Bluetooth Devices. When virtual machine is running, at the Mac menu bar click on the Devices -> External Devices -> tick Apple Bluetooth USB Host Controller. On the Windows side go to Control Panel -> Hardware and Sound -> Devices and Printers. Right click on Bluetooth USB Host Controller -> Bluetooth settings -> tick Allow Bluetooth devices to find this PC and click Apply, OK.
Now, all Bluetooth devices will be displayed and paired with the Windows correctly. 10.1. Check all necessary system requirements for corresponding version of Windows VM. Go to Start, in the Search box type devmgmt.msc and hit Enter (rerutn) -> right-click on the bluetooth device with exclamation mark -> Update driver software. 10.4 If none of the above works, you may want to use another virtual machine which already has these drivers installed and copy applebt* in C:\Windows\System32\Drivers\FileRepository from the working machine to malfunctioning. 10.5 After that, you need to update drivers manually and point it to the aforementioned folder.